“Eight years have passed, this time I come to see that Shenzhen, Zhuhai and some other localities have undergone rapid development, it is really out of my expectations. After seeing all this, I've got enhanced confidence." “Guangdong should strive to catch up with the said "four small dragons" [Hong Kong, Taiwan, Singapore and South Korea] in Asia in a 20-years' time." “Singaporean social order is good, because the country put it under strict control, we should learn from its experiences and should exercise better management of society." “You [the Shenzhen local government] should be bolder in carrying out reform and opening up, dare to make experiments and should not act as women with bound feet." "It is a matter of impossibility for one to consider oneself being always in the right from the very outset, thinking he is one hundred percent correct. I've never thought that way." “[to Shenzhen local government official] Work has been done mainly through your own efforts. I just gave you help and support and contributed my bit in charting the orientation." "Socialism essentially aims to release and develop productive forces, wipe out exploitation and eliminate polarization between poor and rich and finally achieve common prosperity." “In rural and urban reforms, we don't hold debate, instead we make bold experiments and breakthrough"
"If we are to seize opportunities to promote China's all-round development, it is crucial to expand the economy. The economies of some of our neighbouring countries and regions are growing faster than ours. If our economy stagnates or develops only slowly, the people will make comparisons and ask why." It [the production of video laser discs] should be one so and related international rules on intellectual property rights should be abided by." 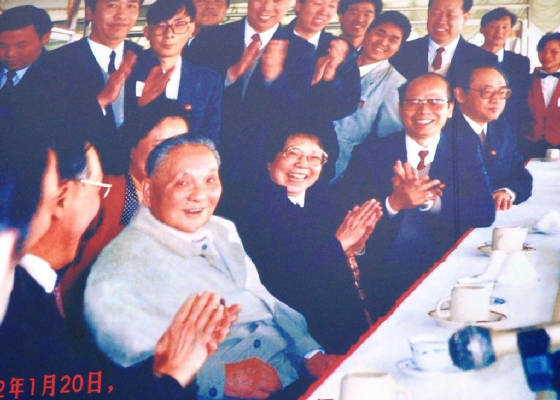 Source: Quotes taken from “Records of Comrade Deng Xiaoping's Shenzhen Tour”, published by the People’s Daily.